At last! The long-awaited, much-hyped “Cost Breakdown”. Never heard of it? Well, good. We’ve got plenty of information in this blog post to introduce you to this new idea we want to share with you: a detailed cost breakdown of your Fairphone. Our phone launching end of this year sells at 325 euro, and we want to account for every euro that’s gone into that price. But even more than that – we’re not just explaining the price of the phone, but also showing what it costs to run a business. To be honest, we don’t know if this is gonna work. It’s almost impossible to quantify every aspect of the production process – but we’ve tried our best and will explain in the most minutiae of specific detail below. So here we go – the official, digitally laminated First Fairphone Cost Breakdown! With this, we’re giving you more insight into the actual process of bringing a smartphone to market, and especially the underlying financial requirements. 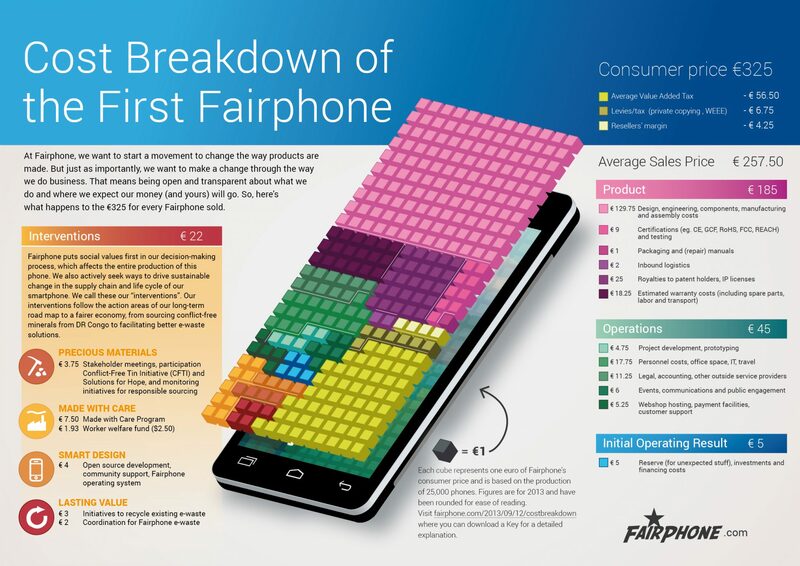 Ultimately, this should give you an overview of where that 325 euro price tag has gone into making a Fairphone. OK OK, you’re probably a bit overwhelmed by the graphic above. Infographics are supposed to be easy, right? Well, yes. You should have seen the first 6 versions. We’ve tried our best to condense the facts into a clear explanation, so while you will find a lot of answers to your questions in the Key attached here, I’d like to take this opportunity to introduce the numbers and frame them better for your understanding. And always, feel free to comment below this post where other community members and the Fairphone team can talk along with you. This cost breakdown serves as an illustration of the overall requirements in making a phone and marketing it in Europe. Both in terms of business operations and essential elements that are required in selling such a device. Please keep in mind that this is an analytical exercise based on estimations, and will not fit exactly with actual financial statements or accounting of the company. Think of it more as the Fairphone team throwing their entire financial overview on a giant wall, making an educated guess on its future finances and estimating on what will span further along the horizon. We’re casting a much wider net than just normal financial reporting. And in this way, it’s risky. The analysis is based on a few assumptions. To start off, we need to establish what costs are actually essential and included, and we basically put them in three different categories. First, we have the actual direct production costs, which are essentially proportional to the actual manufacturing and retail of the phones, and will actually scale with the number of phones produced. This includes for example, the components to build each phone, the manufacturing and assembly, packaging, royalties, and transaction costs at each sale. Next, we have the fixed project costs that are related to the activities that need to be done to produce a phone regardless of the number of phones that we will have manufactured and be selling. These include, for instance, the project development, the whole certification process, the legal work, the travel required and the webshop hosting. This also includes the majority of the supply chain interventions that we are doing in the process of building the phones. And last, we need to include all the fixed costs required to operate a business like Fairphone for the duration of the project. In this case, we assumed that the bulk of the costs that we will incur for our first Fairphone will be during the first year (that is, 2013), and so we only include these fixed running costs for that period. These include essential items like personnel costs, office space, and our IT systems. Another important assumption to keep in mind is that we needed to make a lot of estimations for all future items, which are all based on our current expectations, but could – of course – change in the future. Things like warranty service costs for repairs for the next two years can only be estimated at this point. We’re taking a conservative approach in our planning and using higher estimations for these things, to ensure that we will not end up in financial trouble later on. Now, to arrive at a per-phone basis, we need to add to the per-device direct costs, the total fixed items (both project and company-related) which we will divide by the total number of phones we are going to produce. In this case, we are dividing by 25,000 phones. I think we’ve gone on long enough! I hope I’ve left you with enough to chew on for the rest of the day – or weekend even. Here’s one more link to the infographic, as well as a glossary to explain everything that’s inside. Enjoy, and again hope to hear from you in the comments below.